Home > JULY 2016 > Are you ready for the Ambi PurSmelfieChallenge? Ever wondered if your house has odours too? Or have you experienced an uncomfortable hint of smell in the air when you entered a friend’s house, which you could notignore? Even the cleanest houses have odours, which is picked up by guests even if ignored by the residents. They canbe obviousones coming from trash or pet presence, or the other existent-but-ignored ones like stale food or soiled clothes; they can come from within the house,or spreadfrom surroundingareas. The daily battle with these odours, which is especially heightened during the monsoon season, only gets more difficult if not acted upon immediately. It is not enough to justmask these odours by opening windows or using incense sticks. It is imperative to completely remove them. 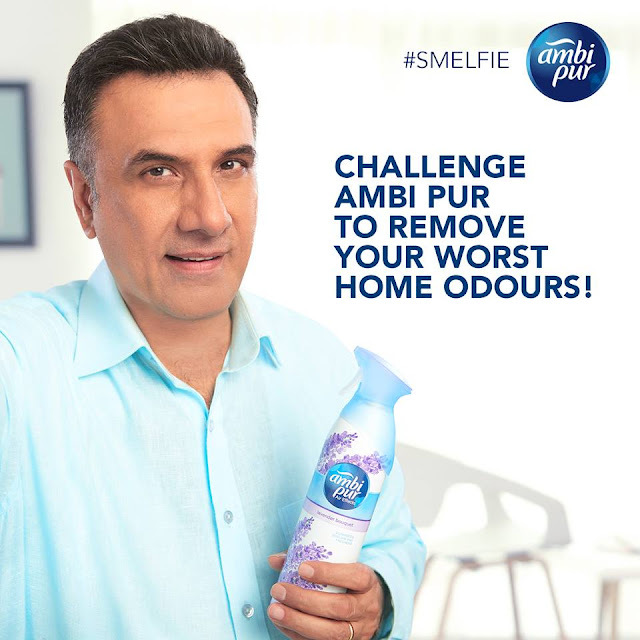 And to live up to this challenge of complete elimination of household odours, the funny man of the countryBoman Irani, in association with Ambi Pur Air Effects, takes it on himself by launching the first of its kind ‘NationalSmelfie Challenge’. Boman Irani,as the Brand Ambassador forAmbi Pur India, is inviting consumers to click ‘smelfies’ with what they considerthe most difficult household odour to get rid of, and send it to the #Smelfie contest platform (http://bit.ly/2aFfXqb) during the contest duration of 15 days. With this very unique contest, lucky winners willstand a chance to get invites to an exclusive House Party being hosted by Boman Irani where, armed with Ambi Pur Air Effects, he will live up to the challenge and combat the toughest household odours brought in by the winners themselves. Boman Iraniis convinced of the efficacy of the product, as has been using Air effects to keep his house guest-ready by taking care of his household odours. Hence, he has taken this challenge upon himself on behalf of Ambi Pur.Boman is so confident of Ambi Pur emerging victorious against the toughest odours that he has also announceda forfeit in case Ambi Pur doesn’t live up to the challenge: he will change 100 diapers in a nursery! According to an independent third party agency survey on Indian households supported by Ambi Pur,94percent* of Indian women agree that a great smelling house will always feel new. On the other side, 71% of Indian women agree that they are often irritated by odours within the household. Ambi Pur Air Effects can be your essential weapon to fight against your household odour as it does not just cover, but truly removes the odour, leaving a fresh-light scent which keep you and your house always guest ready. So, take the ‘Smelfie’ challenge and join Boman at his house party. About the Survey on Indian Households..! An Independent Third Party Agency Survey on Indian Households was conducted in 3 cities (with a total of 992 respondents). The survey was carried out in April, 2015, and was conducted among men and women in Mumbai, Chennai, Delhi. *Claims generated from men and women who were in agreement with the above statements as per a 3-city (992 respondents) survey conducted by an independent third party agency in Mumbai, Delhi, Chennai, in April 2015. About Procter & Gamble India..! P&G serves consumers in India with one of the strongest portfolios of trusted, quality, leadership brands, including Vicks ®, Ariel®, Tide®, Whisper®, Olay®, Gillette®, AmbiPur®, Pampers®, Pantene®, Oral-B®, Head & Shoulders® and Old Spice®. P&G operates through 3 entities in India of which 2 are listed on NSE & BSE. The listed P&G entities are: ‘Procter & Gamble Hygiene & Health Care Limited’ and ‘Gillette India Limited’, whereas the unlisted entity (which is a 100% subsidiary of the parent company in the U.S) operates by the name ‘Procter & Gamble Home Products Ltd.’ In the last 12 years, P&G’s signature CSR program P&G Shiksha has built and supported 1000 schools that will impact the lives of 10,00,000 underprivileged children across the country by providing them with access to education. Please visit http://www.pg-India.com for the latest news and in-depth information about P&G India and its brands.